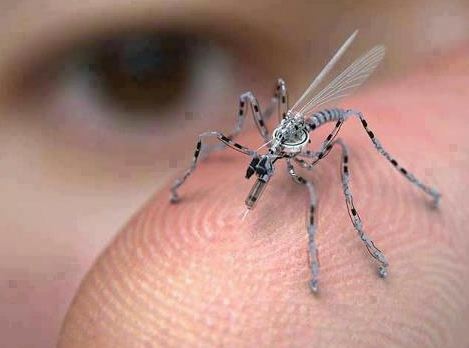 Insect Spy Drone — Is this real? — Lights can be printed onto wallpaper. Researchers fromLinkoping University, Sweden, have grown white LEDs (light emitting diodes) on paper. This is the first time anyone has built LEDs directly on paper. — Coming in 2013 or 2014 to an airport terminal near you: You won’t have to walk through a scanner. Maybe. Special high-frequency laser beams will be able to detect explosives, drugs, and even what you had for breakfast from up to 160 feet away. The equipment is made by Genia Photonics of Canada. The Russians have developed a similar system. The technology isn’t new, just a million times faster than a similar system invented in 2008. Police cars equipped with this technology could spot individuals with increased adrenaline in their systems, those most likely to react violently, or measure alcohol and drugs in the blood.